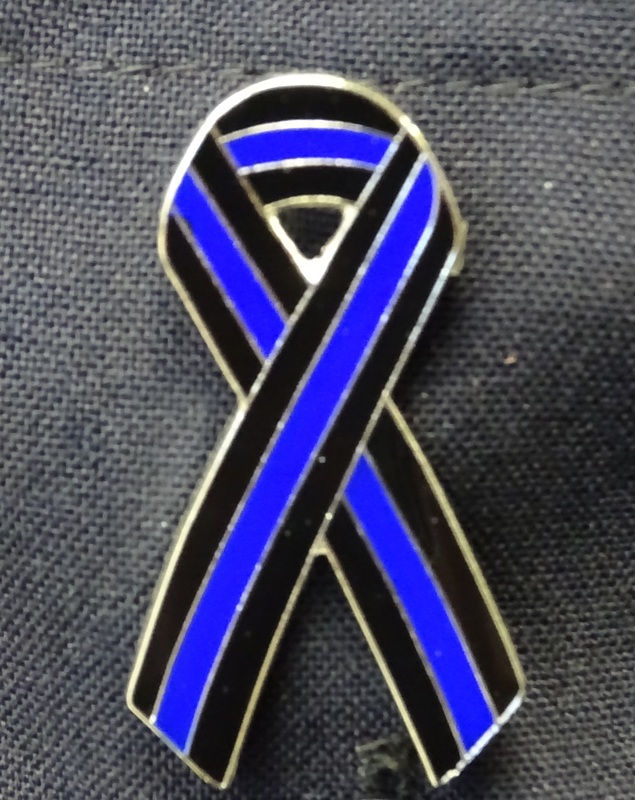 Posted on Sep 14, 2015 by Appleton Downtown Inc.
Appleton Police Chief Todd Thomas recently authorized the wearing of a blue and black ribbon, during the month of September, on the uniform of employees of the Appleton Police Department. In conjunction with us wearing these ribbons, we are supplying C.O.P.S. (Concerns of Police Survivors) ribbons, in the lobby of our department, for any community member wishing to show support for law enforcement. Trooper Trevor Casper, Officer Craig Birkholz, Deputy Frank Fabiano, Jr., Special Agent Jay Balchunas, Deputy Bruce Williams, Deputy Michael Shannon, Officer Robert Etter, Jr. and Officer Stephanie Markins were killed because of their profession, not because of who they were. “Blessed are the Peacemakers, for they shall be called the children of God”. In the words of Chief Thomas, “This quote is carved on too many memorials to fallen officers across our country”. The aforementioned names are inscribed on memorials bearing the quote; as are the names of over 80 officers, deputies and agents who have died in the line of duty in 2015. Many of those 80 were victims of violence because of what they represented; not because they were fathers, mothers, sons, daughters, brothers, sisters or friends. repeatedly for being an innovative, progressive and inclusive law enforcement agency, we know we can improve. Our community is not Ferguson, Baltimore or New York. While we have room to improve as a community, we do not face the challenges faced in those communities. For that, we are fortunate. The Appleton Police Department and residents of Appleton have worked well together for many years. “Where other departments are just now starting to talk about things we have been doing for years; we have engrained the sense of community in our employees and woven the belief into the fabric of our department”, according to Chief Thomas. Mental health, socio-economics, drug and alcohol abuse along with hate speech and racial polarization are real issues currently facing the Appleton Police Department and our community. The Appleton Police Department believes in compassionate treatment of all people. Our involvement with CIT (Community Intervention Training), Drug Treatment Courts and Boys & Girls Clubs of the Fox Valley represent a fraction of our commitment to making this a safer community for all who live, work and play here. The ribbon represents our commitment to one another, to the citizens of our community and to the lives of our fellow officers; Federal, State and Local. It also represents the lasting memory of those who have died protecting the lives of others. If you would like further information please contact Sgt. Lund at (920)832-5509.